Dr. Zadeh of Encino, CA. ranked among the top physicians in the nation based on patient reviews for the third consecutive year. ENCINO, Calif. - Feb. 4, 2014 - PRLog -- Patients' Choice has announced that Dr. Michael Zadeh was one of a select few physicians honored with the prestigious 2013 Compassionate Doctor Certification. Each year, nearly 100 million patients across the U.S. access websites like Vitals and UCompareHealthCare to provide feedback about experiences with their physicians. Only those physicians with near perfect overall and bedside manner scores, as voted by their patients, are selected for the Compassionate Doctor recognition. Of the nation's 870,000 active physicians, only 3% were accorded this honor in 2013. Dr. Michael Zadeh commented on the recognition: "This is quite an honor for me. I am very pleased to have been selected for the third year in a row and grateful to my patients who went out of their way to rate me and give me positive reviews." Dr. Zadeh provides state-of-the-art minimally invasive surgery treatments to patients throughout the Los Angeles area. He is also the owner and medical director of the Z Center for Cosmetic Health (http://www.zcosmetichealth.com) in Sherman Oaks, California where he performs the latest non-invasive cosmetic procedures. The Z Center for Cosmetic Health was established by Dr. Zadeh to fill the growing needs of his patients who desire non-invasive, non-surgical cosmetic procedures. 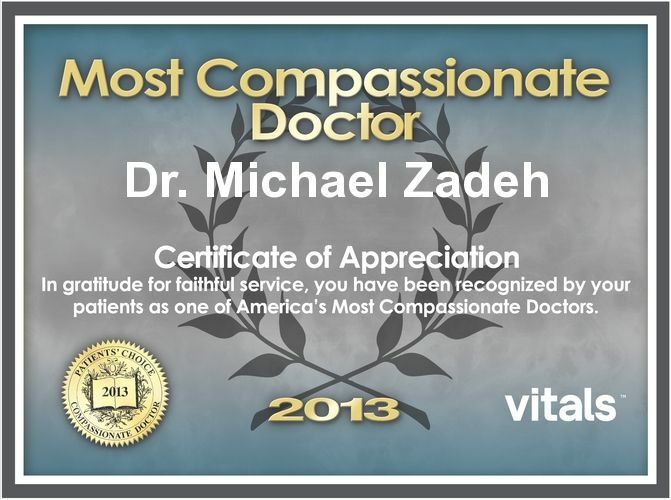 For more information on this Compassionate Doctor, please visit Dr. Michael Zadeh's profile on Vitals.com. Following the publication of Dr. Michael Zadeh's selection for the Compassionate Doctor Award, American Registry seconded the honor and added Dr. Zadeh to The Registry™ of Business Excellence. Patients' Choice provides in depth information on doctors in your area who have been recognized and awarded for outstanding patient care and expertise. The Compassionate Doctor certification is the honor role of physicians who have received the highest overall and bedside manner ratings by their patients. American Registry, LLC, recognizes excellence in top businesses and professionals. The Registry™ includes over 2 million significant business and professional recognitions. For more information, search The Registry at http://www.theamericanregistry.com.